AT KEMPTON PARK, near Sunbury, Middlesex, a series of large reservoirs stores water tor use in the London area. This water is drawn off from the River Thames, and the reservoirs alongside the river form a prominent feature of the lower Thames Valley. The water is treated in filter beds, seen in the foreground, before being pumped into the mains for supply to consumers. FOR each man, woman and child in the area known as “Water London” approximately forty gallons of water are used in one day. The population of the area served by the Metropolitan Water Board is about 7,500,000. The quality of the water must be irreproachable, but only in comparatively recent years has it been so. Even as late as the Victorian era diseases caused by bad water were common among all classes of the community because of the chaotic state of water supply and drainage. For their present high standard of health Londoners are largely indebted to the plentiful supply of pure water delivered to their homes. In the Middle Ages numerous drains ran into the Thames, and the City’s drinking water came out of it. A few spasmodic attempts were made to improve matters. In 1236, King Henry III granted to the City Corporation the right to convey water through lead pipes from Tybourne village, near where the Marble Arch stands today, into the City, but the amount conveyed was inadequate. In 1582 a Dutchman named Peter Morrys erected a water wheel, the first of several, which raised water out of the Thames at London Bridge. Of the quality of that water the less said the better. The real father of London’s present water system was Sir Hugh Myddelton, a Welshman, and the creator of the New River. This calm, canal-like artificial stream begins near Ware, Herts, taking the pure water from the springs in Hertfordshire, and comes down to the headquarters of the Metropolitan Water Board at Clerkenwell. Myddelton began work on the New River on February 20, 1608, and his works had proceeded only as far as Enfield, Middlesex, when his capital ran out. The New River Company did not enjoy a monopoly. Other water companies were formed and it was possible to find representatives of three different companies canvassing the same street for custom. Until 1852, water was still drawn from the Thames within a few miles of London Bridge and sold for domestic Use. Only in that year was it made illegal to draw water from the Thames below Teddington Weir. The Government left the areas of the different companies loosely defined to promote “healthy competition”. The result was not as satisfactory as a method of unified control promised to be, and because of this the Metropolitan Water Board was formed in 1902, to take over the works of all the old companies in the London area. The liability for debenture stocks of about £12,000,000 was transferred, and more than £30,000,000 was awarded to the old companies in compensation, which is still being paid off. Annuities amounting to £3,750 a year are also being paid on account of the old London Bridge water wheels, which were demolished in 1831. The work of the Metropolitan Water Board to-day is far-reaching. London’s daily consumption of water averages 279 million gallons. It may well be asked where all the water comes from. 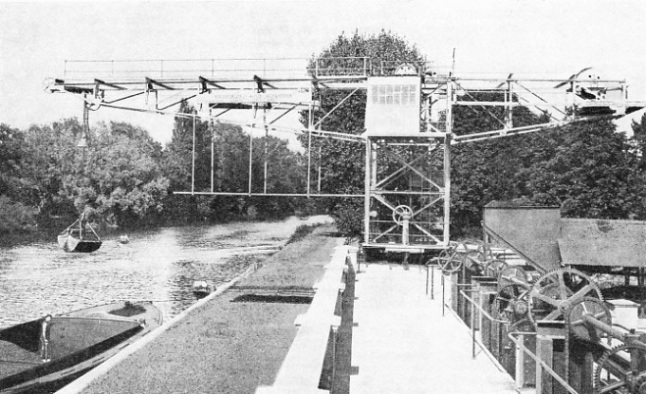 AT A RIVERSIDE WHARF at Walton-on-Thames, Surrey, fuel for the plant operated by the Metropolitan Water Board is unloaded from barges by an electric transporter crane. This crane has a capacity of 2 tons and the radius of its jib is 44 ft 6-in. Some of it comes from the New River; but the New River, built to serve seventeenth-century London, could not supply modern London. By far the greater part comes from the Thames above Teddington, Middlesex. Another considerable source of supply is provided by the deep-level wells in the chalk and greensand areas (see the chapter on “Artesian Wells”). 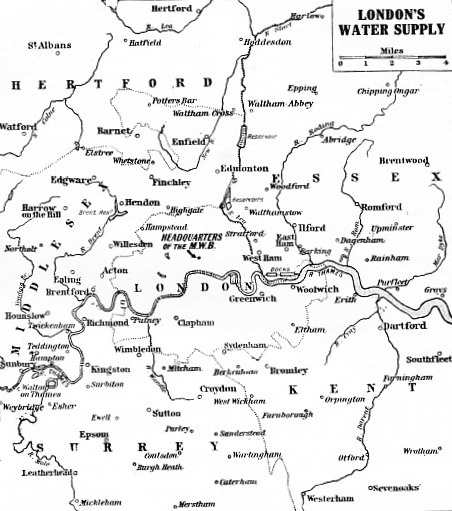 The immense area served by the Metropolitan Water Board may be described as extending from Sunbury in the west to Southfleet in the east, a distance of 34 miles, and from Hertford in the north to Westerham in the south, these being approximately 42½ miles apart. The area is not regular in shape; it throws out tentacles to such places as Dagenham, Hendon and Ealing. Altogether, it contains 537 square miles of territory, accommodating one sixth of Great Britain’s total population, and nearly a million more than the population of the Australian Commonwealth. Even so, the Board’s area does not cover the whole of Greater London; Harrow and Uxbridge are outside it on the west. In the south there is another big area served by other authorities round such suburbs as Croydon, Sutton and Epsom. At the time the Board was constituted these places were surrounded by green fields. The constancy of a city’s water supply depends on the reserve capacity of its reservoirs. A narrow margin of reserve is useless; the reservoirs must have a vast margin. To provide the necessary margin for London’s daily consumption, reservoirs of the Thames and Lea Valleys have a combined capacity of over 19½ thousand million gallons, and more reservoirs are planned to bring the total up to more than 31 thousand million gallons. When all the projected works are completed, the Board’s reserve supply of water will be sufficient to support the life of 42,000,000 people for three years and a quarter. At the normal rate of supply, however, those reserves would last London’s population over a period of little more than fifteen weeks. Briefly, the main stages in the treatment of London’s water are as follows. First of all come the intakes from the rivers. From these intakes the water is pumped into the huge storage reservoirs, which are such a striking feature of the riverside in the lower Thames Valley. Storage is followed by filtration, and after chlorination the water is pumped into the mains. Thence it may either find its way direct to the house mains and other services, or go through a second pumping process designed to carry it to services situated at an unusually high level, as in such places as Sydenham and Norwood in south-east London. Smaller reservoirs, distinct from the great storage reservoirs, form part of the distribution system of the mains themselves. The reason for the existence of these distribution reservoirs is that the demand for water does not remain constant. The flow through the great pipe lines from the Thames and Lea Valleys never ceases, but the daily consumption of water varies and undergoes fluctuations at different hours of the day. In the morning, and particularly on Monday morning, consumption is higher than normal. In the middle of the night and in the small hours of the morning it is much lower. MASSIVE PUMPS driven by reciprocating engines raise 32,000,000 gallons of water a day from Kempton Park, Middlesex, to a service reservoir in north-east London, a distance of eighteen miles. This great amount of water is about a ninth of London’s average daily consumption. During those hours, therefore, the surplus water from the main pipe lines is pumped into the smaller service reservoirs at the distribution centres, where it remains until the next big demand occurs in the early morning. Some of these distribution reservoirs, especially when they are situated in the southern suburbs, are located at a considerable height above sea level, the highest being at Betsom’s Hill, Kent, 818 feet above sea level. The river sources of London’s water supply, the Thames, the Lea and the New River, provide by far the greater proportion of the whole. The great Thames waterworks are situated along the stretch between Staines (Middlesex) and Surbiton (Surrey), with further works in London at Kew Bridge and at Barnes. The Lea works are along the reach between Enfield and Leyton, and the principal New River works are at Hornsey and Stoke Newington. The provision of reservoirs near the intakes originated when, early in the nineteenth century, it was realized that water assumed a more sparkling appearance if it were allowed to stand for a while, instead of being delivered straight to the mains. Later, these storage reservoirs became a necessity to guard against sudden shortage occasioned by an unexpected slackening in the river flow. To-day the reservoirs serve a dual purpose, but the purification is carried further. A reservoir is no mere pond; nor is the intake a simple mill-race opening off the river. No finer examples can be taken than those provided for the great Queen Mary reservoir at Littleton, situated approximately midway between Staines and Hampton, Middlesex. The intake arches on the banks of the Thames are screened by great wooden booms which arrest floating driftwood, tree branches and other flotsam otherwise likely to enter. Behind these are metal screens, designed to form a similar obstacle to waterlogged leaves and other rubbish. Three great “Venturi” meters record the amount of water entering the intake, whence a channel carries the raw river water to the pumping station. These meters are a necessary adjunct, for the Board cannot take as much water as it pleases. The maximum amount, according to the flow of the river, is governed by statute, and a minimum of 170 million gallons a day must pass by the Board’s intakes and flow over Teddington Weir. On the River Lea, where the Board has intakes at Hertford (for the New River), Enfield and Chingford, 5,400,000 gallons a day must be the stream’s normal flow below the intakes. At the Littleton works steam pumping engines force the water from the intake over the side of the Queen Mary reservoir through four huge pipes, each 5 feet in diameter. The machinery consists of four centrifugal pumps, each driven by a single-cylinder uniflow steam engine, and each having a daily capacity of 75 million gallons against a head of 40 feet. With its huge bank, which has a central core of clay impervious to water, the storage reservoir is an entirely artificial basin and in no way related to the dammed-up valley or lake such as those in other parts of Great Britain. The central core is carried below the banks down to the natural watertight layer of London clay. The bank foundations are built in the first place by digging a trench all round the site of the future reservoir, and filling it up with the puddled clay. The Queen Mary reservoir is built on these simple lines, the principle of which dates back to the earliest times, yet its capacity is 6,750 million gallons, and its area is 723 acres. From such a reservoir the whole of London could draw its supplies, at the present daily rate, over a period of twenty-four days. For a city of the size of Winchester, Hants (population about 23,000), the water in the Queen Mary reservoir would last twenty-three years. The King George reservoir in the Lea Valley is roughly half as large. Here there is a big installation of Humphrey pumps driven by gas engines, but it is more usual to use steam power for filling the storage reservoirs. IN THE PUMPING STATION at Kempton Park, Middlesex, are two of the largest steam reciprocating pumps in Europe. Each engine is of 1,008 horse-power and stands 62 ft 6-in high. Water from the Metropolitan Water Board reservoirs is pumped into a main with a diameter of 48-in. The pumps operated by the Metropolitan Water Board have a total output of 57,477 horse-power. About 87 per cent of the pumping engines use steam power. After it has been drawn off from the storage reservoirs, the water has to be filtered. A certain amount of purification has already taken place, but there are many foreign substances with which a simple settling process could not be expected to deal. It might be imagined that rainy weather in the late autumn and during the winter would cause the greatest filtration difficulties, because of the amount of mud brought down by the rivers. The main problem, however, occurs in spring and early summer, and especially in warm, dry weather; for during such periods the vegetable growths known as algae spread all over the underwater surfaces. The New River suffered severely from this natural complaint during the drought of 1934. The spread of this vegetable matter necessitates frequent cleaning of the filter beds during the time when it is rampant. Another source of pollution in the storage reservoirs is caused by ducks, swans and, during hard weather, gulls. A big swan is about the last visitor the Board’s officials want to see on one of their reservoirs. The modern filter bed consists of a tank about an acre in extent, with a depth of 9 feet. It is built of concrete and brick, with a floor of perforated tiles or separated bricks, forming under-drains leading to the main collecting drains in the foundations. Above this comes a layer of gravel a foot thick, with the coarser stones at the bottom, and above that are 2 feet of fine sand. The water percolates through the sand at an average rate of four inches an hour, gradually leaving a fine film of sediment on the surface. In the course of time, this sediment deposit becomes too thick to allow the passage of water, and then it is time for the filter bed in question to be cleaned out. The slimy nature of vegetable growths hastens the necessity for such a cleansing. To overcome the difficulties caused by these growths, a system of double filtration has been introduced, and the water is passed rapidly through smaller filter beds containing coarse sand before being passed to the main filter beds. To clean the main filter beds all water is emptied, and the layer of sediment, with some three-quarters of an inch of sand under it, is scraped off by hand. The scrapings are passed to a sand washer, where a constant flow of running water breaks them up and separates them, ultimately leaving the sand clean and ready for further use. The rapid primary filters, in their turn, are cleaned by the upward passage of compressed air and water which has already been filtered, the compressed air tending to break up the surface deposit, and the filtered water tending to carry it away. AN AREA OF 537 SQUARE MILES is served by the Metropolitan Water Board. This area, included in the map, is inhabited by one sixth of the total population of Great Britain, being about 1,000,000 more than the population of the Australian Commonwealth. Most of the water is supplied by the Rivers Lea and Thames, but there are numerous deep wells. Fifty-one deep-level wells have been sunk in the chalk and four in the greensand. A small installation of primary filters was constructed at Barn Elms, London, S.W., in 1922, and a larger self-contained double filtration plant was installed at the Walton-on-Thames works of the Board in 1925. 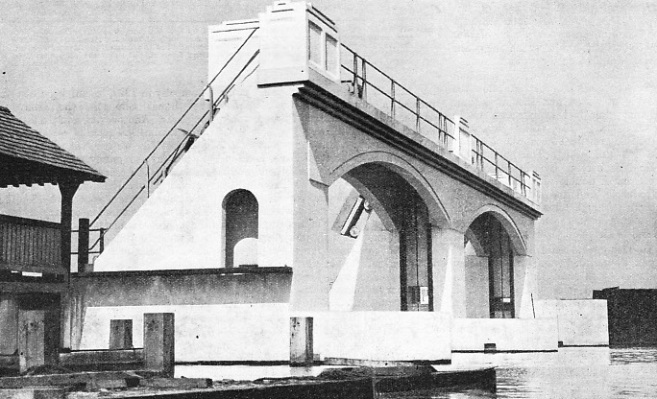 This was designed by Mr. H. E. Stilgoe, who was Chief Engineer at the time, and met with such success that similar installations for rapid primary filtration are now in existence at Kempton Park and Stoke Newington. A further installation has been designed for construction at Hampton-on-Thames. The first sand filter bed was used at the Pimlico Works of the old Chelsea Water Company in 1829, having been designed by James Simpson, the Company’s engineer. Another phase in the filtration and purification process is the chlorination of the water. That this is done at all surprises many people, especially those who can remember drinking water rank with the chlorine added to suspected wells during the war of 1914-18. It is, however, considered necessary to introduce minute quantities of chlorine and ammonia to the water to destroy any harmful bacteria which might slip through the filter beds. All water drawn from the Thames, Lea, or New River is chlorinated after its passage through the filter beds to ensure its absolute purity. The New River is treated with chlorine just above the Hornsey waterworks, and plant for treating filtered water from the Lea Valley is installed at Lea Bridge and Stoke Newington. Apart from the river intakes, the wells form other important sources of London’s water. The London clay lies in a trough of chalk, the edges of which come to the surface to the south and north of the Thames Valley, forming the North Downs and the Chiltern Hills. Chalk and the water-bearing greensand below provide an enormous source of absolutely fresh water, and into the chalk fifty-one deep-level wells have been sunk in the Board’s area, a further four wells penetrating the greensand. The biggest of London’s well stations is at Deptford. Although the supply from London’s wells is small compared with that taken from the Thames, it is still sufficient to fulfil the needs of a city the size of Manchester, with a population of about 766,000. The big pumping engines used for raising water from the river intakes to the storage reservoirs have already been mentioned, but by far the most extensive power installations are those which pump the filtered and treated water into the mains. The Metropolitan Water Board’s pumping engines have a total output of 57,477 horse-power. About 87 per cent of them are steam engines, either reciprocating or turbine; 11 per cent are oil engines, and the rest are electric motors or suction gas engines. Their work is continuous in the strictest sense of the word. In the great Surbiton station there are four 1,200 horse-power steam turbines driving centrifugal pumps capable of delivering 92 million gallons in one day. Normally only two of the turbines are in use. The water from these works passes to South London and Chelsea. The turbines at Surbiton are known as the “Sir George” and “Lady Handover” engines. Enormous water tube boilers with mechanical stokers generate the steam required by the pumping machinery. The water supplied by Surbiton to the high-lying ground in the Sydenham district has to be pumped again at Brixton, where the installation consists of seven 150 horse-power oil engines, each capable of pumping 3½ million gallons daily against a head of 200 feet. A rather different installation exists to deal with the well water at the Deptford station. 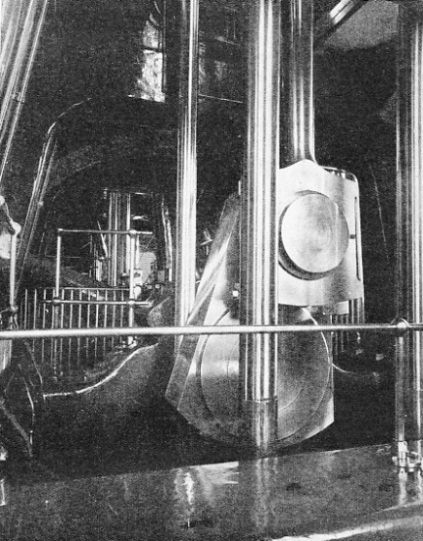 Here a vertical triple-expansion steam engine, the “James”, performs the dual task of raising water from the well and delivering it into the supply system. 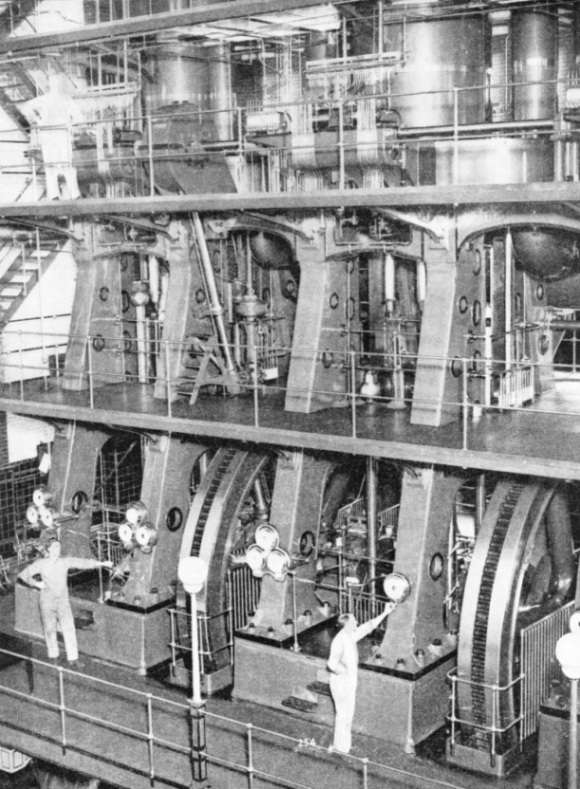 Three steam turbines driving centrifugal pumps are maintained as stand-by sets in the same station. London’s water mains are the arteries of the whole system. Altogether, there are 7,800 miles of them, varying in diameter from 2½-in to 5 ft 6-in, and consisting chiefly of cast-iron pipes. From the Surbiton-Kempton Park area there radiate to the east and north-east twenty 30-in mains, as well as others, in other directions. The supply reservoirs number ninety-five and form part of the main service system. They have a total storage capacity of 341 million gallons. 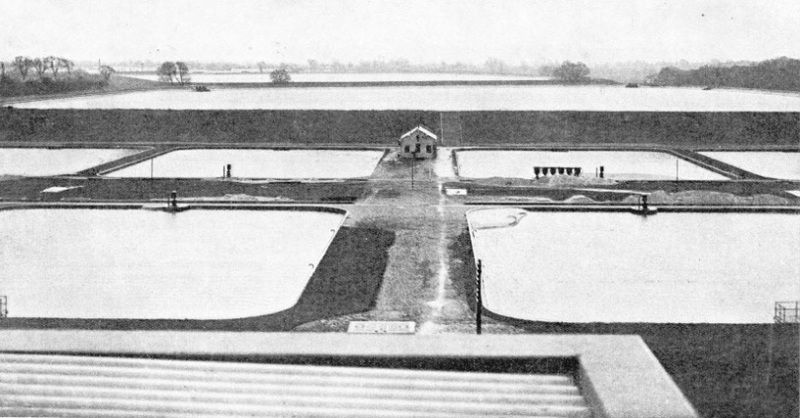 Three new storage reservoirs, one at Staines, one near Walton-on-Thames, and a third in the Lea Valley, were being planned in 1936, the scheme providing also for seventeen miles of trunk main, of 42-in diameter, between Hampton-on-Thames and Nunhead and Honor Oak, and an eighteen-miles main between Kempton Park and Hornsey. This second main will have a diameter of 5 feet as far as Cricklewood, the diameter being reduced to 4 feet beyond Cricklewood. An integral part of this ambitious programme includes the complete rebuilding of the great Hampton waterworks, where new pumping appliances will replace the old appliances in seven of the stations, bringing the daily output up to 120 million gallons. The total cost of these improvements is estimated at £6,000,000. Such is the great public service on which depends the existence of London. TEDDINGTON WEIR is the largest and farthest downstream of all the Thames weirs. Below this weir the Thames is a tidal river. The photograph shows the navigation lock at one end of the weir. By statute a minimum of 170,000,000 gallons a day must be allowed to pass over Teddington Weir. The greater part of London’s water supply comes from the Thames above Teddington. You can read more on “Artesian Wells”, “Controlling the Thames” and the “World’s Greatest Aqueduct” on this website.